Class B seems to have been settling into a dynasty mode in recent years. Pittsford Mendon took three titles between 2013 and 2015, and there is good reason to believe that a young and expanding Burnt Hills program is putting together a streak of its own beginning with its 6th overall last year. As the top rated team in the state even ahead of the Class A squads, the Spartans appear to have a pretty clear march to a second States triumph in a row. Burnt Hills' rampage through Section 2 country may have to contend with just a renegade group of Spartans from Queensbury making small mischief again, but there are a good group of other Sectional battles that will likely go down to the wire. The biggest will be in Section 1, where six highly rated teams will be in a scrum, and Pearl River in very good position to unseat reigning champ Somers. Pittsford Mendon is still the top power out in S5-B, but Brockport and Honeoye Falls-Lima are watching for leaks in the Viking's ship. And the Dragons of Cornwall are trying to regroup to unseat an upstart Goshen team that took a B sectional last year for the first time since it won at States in 1997. Last year Burnt Hills staked its claim to the big time by winning States with a top 5 there that included no juniors or seniors. 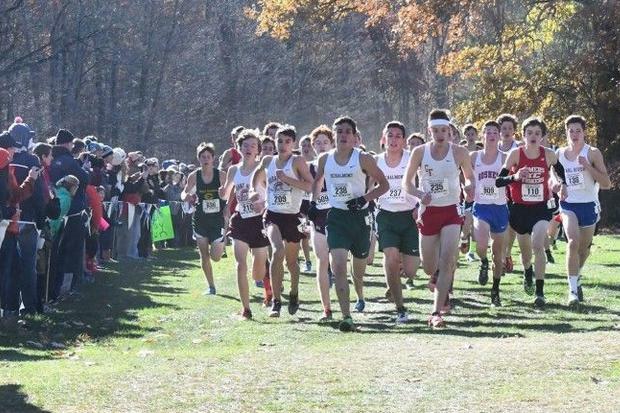 Now a year older, the Spartan sextet of Evan Brennan, Tyler Berg, Aidan Gillooley, David Metacarpa, Kevin Board, and Nick Hunzicker with oldster Michael Messere joining in are already running well above the other teams in the state, and these guys clearly have a lot of room to grow. A seventh States championship and second trip to Nationals eight years after the first definitely seem in the cards. If you had to pick two teams that had the best chance to make Burnt Hills sweat a bit, it would be two marauding seafarer types who have combined for five States titles over the years. Pittsford Mendon put together top level power and huge depth from 2013 to 2015 to win three state championships, but though reigning champ Nathan Lawler may be the top runner in the state and sophomore brother Sam speeding upward, the Vikings need more to get the depth to stay with Burnt Hills. Pearl River's Pirates also seem set to do some rampaging with senior Matt Politis leading a strong young group, but Burnt Hills still looks to be running a ways ahead. Class B not only has New York's top team, but also the top runner. Nathan Lawler stashed one States title in the bag last year and is rated far ahead of the rest of the Class B runners, especially after taking 40th at NXN Nationals. The pack well in back of him includes Burnt Hills frontrunner Evan Brennan, Somers twins Matt and Greg Fusco, Pearl Rivers' Matt Politis, and West Seneca East's Ray Sambrotto. The killer B's are heading out in a swarm at last year's States race. Pittsford Mendon's Nathan Lawler was by himself for much of the Class B States race as he claimed the championship after taking 2nd in 2015.